Google has just launched an Android application called YouTube Go APK and now the latest version is 0.26.67 beta. The main function is to help users to save data packets of the internet while watching the video. Those of you who are interested can now directly opt to watch a video via streaming or download them to watch offline every time you find an interesting video. Not only that, you can send the video offline to another YouTube Go user via WiFi so you or your colleagues who sent video alike are not extravagant quota. However, Google will also be noted that this process will require access to the internet to perform security checks 15 KB after video received. After you download this apps, the home page would display a variety of videos that can be downloaded for viewing offline, but the order will not be as attractive as video recommendations as listed on the home page of regular YouTube application. This app works just like regular YouTube application but when you select a video to be seen, this app will ask if you want to download the video. Video provided is available in two resolutions i.e. “basic quality” (which look like 144p) and “standard quality” (probably 360p). There is no access to HD resolution here. However, this application is designed for areas with a relatively slow internet speed on devices with small storage capacity. This app works great on my devices. It’s very useful for low bandwidth connection or slow speed connection. Besides that, the UI is also easy to be used, great user-friendly UI. 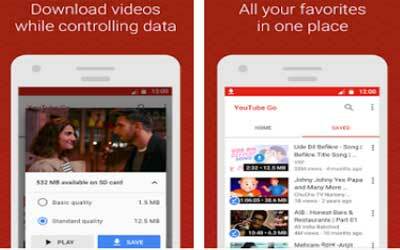 Overall, it is best app for YouTube users with slow speed or low bandwidth connection.